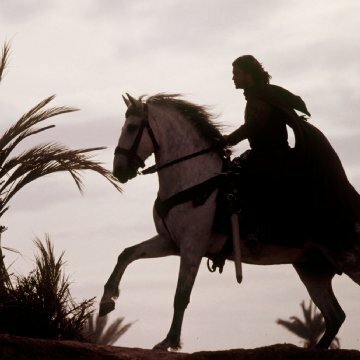 In the 'burning bush scene' in the Director's Cut of the film, Balian's horse jumps as the camera pans across the desert, just after the character of the Hospitaler (David Thewlis) has 'disappeared', thus enhancing the sense that the character is a spirit of sorts. According to director Ridley Scott, the horse did this completely spontaneously as the scene was being shot. Factual errors: A few times during the movie, the Muslims are shown praying while the prayer call is being delivered. The prayer call precedes the prayer. Squire: Clear the road, if you will. In 1935, Cecil B. DeMille made his famous epic "The Crusades" on one of the backlots of Hollywood. What a change in the Ridley Scott film "Kingdom of Heaven" of 2005 with the technical wizardry of a new era! Although it is not a perfect film, it is nonetheless skillfully crafted and well worth the time of any film-goer in our current, troubled age. 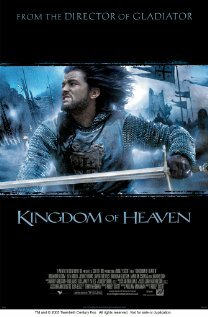 From the visual and technical standpoint, "Kingdom of Heaven" is masterful. The recreation of medieval France and the city of Jerusalem were brilliant technical achievements. The French landscape recalls the region around medieval Clermont and Vézelay where Pope Urban and Bernard of Clairvaux delivered their momentous calls to arms for the early Crusades. 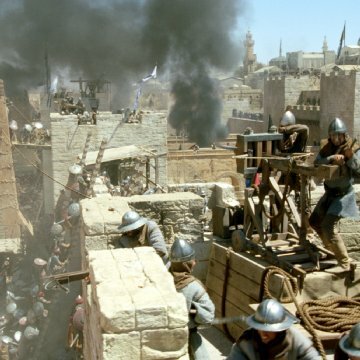 And in the recreation of Jerusalem, the film artists truly drew us into the twelfth-century walled city with sacred roots in Judaism, Islam, and Christianity. Much credit should go to cinematographer John Mathieson, costume designer Janty Yates, and all of the film's art directors. The film's events spanned the era between the Second and Third Crusades, and the evocation of this epoch was simply spectacular. In the genre of the epic film, the leading actor is crucial, as in the unforgettable performances of "Lawrence of Arabia" (Peter O'Toole), "Tess" (Nastassja Kinski), and "Bridge on the River Kwai" (Alec Guiness). 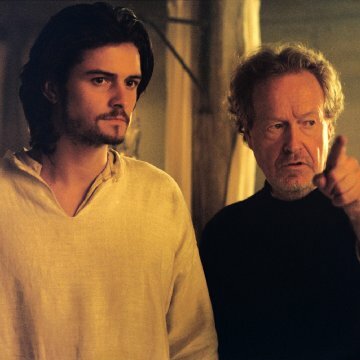 One weakness of "Kingdom of Heaven" is leading performer Orlando Bloom. Although this young actor has fine screen presence, his performance was subdued and monochromatic. The Crusaders were driven by zeal, and Bloom's character Balian seems mired in melancholia following the death of his infant child and the subsequent suicide of his wife. Bloom's character does not even evolve much when upon arriving in Jerusalem, he falls in love with the mysterious Sibylla. Neither courtly love nor the fires of faith could ignite a spark of passion or change the expressionless, emotionless face of Orlando Bloom. As Sibylla, Eva Green also seemed out of place in this film. The closest historical prototype for her character was the formidable Eleanor of Aquitaine, who accompanied her husband King Louis on the Second Crusade, during which Eleanor had a stormy affair with her uncle Raymond of Antioch. Eva Green's character seemed closer to a young woman from the twenty-first century, as opposed to the twelfth. Other performances were stronger, including those of Liam Neeson as Balian's father, Jeremy Irons as Tiberias, and Edward Norton as the King. Those actors really resembled medieval knights. Norton's characterization of the king victimized by leprosy and forced to wear a mask was one of the most sensitive character portraits since Ralph Fiennes' role as "The English Patient." Norton's characterization offers a glimpse into the softer side of the great medieval knights, such as the legendary Richard the Lionheart, a poet and troubador, as well as a king. Ghassan Massoud also merits praise for his portrayal of Saladin as not only a brilliant general, but a figure of great dignity. At a time when we are at war in the Middle East, the screenplay and dramatic impact of "Kingdom of God" were thoughtful and worthy of serious reflection for any film-goer. I was especially struck by the theme of honor that ran through the film. The actions of the main character of Balian were guided by honor. And the character of Saladin was portrayed as an individual of great moral rectitude. The Western cultural heritage of chivalry, courtly love, and honor filtered into Europe through Islamic traditions, which "Kingdom of Heaven" seems to acknowledge. There is a powerful moment in the film where Saladin discovers a small Christian cross that has toppled over. He takes the time to pick up the fallen cross and set it aright. In a film filled with special effects and spectacular scenes of siege warfare, that moment of simplicity was the most meaningful and important one for me.